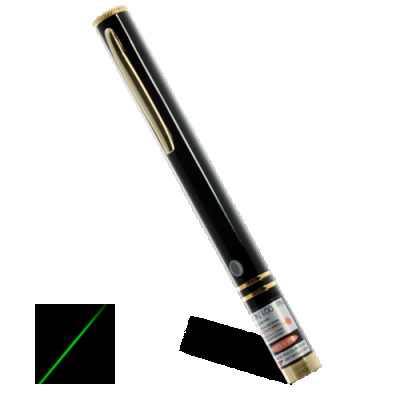 Successfully Added High Powered 50mW Green Laser Pointer Pen (Golden Executive Edition) to your Shopping Cart. This high powered Green Laser Pointer is designed as a high class executive accessory; it’s the perfect tool for professional presentations. Everyone has a red laser pointer nowadays; instead you can get a Green Laser Pointer and have something more special, powerful and functional. With a green laser pointer you can actually view the green laser beam in mid air in dark conditions, instead of just a projected surface dot. Green is the most sensitive color among all types of laser crystals, which makes the green laser pointer the brightest laser you can have. What’s more, the medium wavelength of 532nm has made the beam dispersion to be superior to many other laser pointers. Designed with portability in mind, the pointer comes in a compact form factor that resembles a pen enabling it to be carried conveniently anywhere, anytime in your pocket. If your goal is to deliver the perfect presentation and capture the attention of the audience, this professional presentation gadget will effortlessly and clearly highlight key points for everybody in the room. Simple to use, with a click of a button, this useful gadget delivers a consistently strong beam with pinpoint accuracy using green laser optics. It’s also great for star gazing; you can point out your favorite constellations to your kids, students or colleagues, or just sit mesmerized in the lovely green glowing laser beam that is firing out. This is the ideal tool for presentations, star gazing, signaling, highlighting dangers, lectures, seminars, project screens, charts, slides, tour guides, facility inspections and law enforcement personnel. With a bright and powerful green colored laser, this laser pointer is the quintessential gadget for highlighting information and pinpointing important and/or hard to reach areas. It’s also a perfect gift and great as a toy for pets, especially for cats to play with, they’ll love chasing the mysterious green beam and you can have hours of fun having them try to catch it. At only a fraction of the price of similar products, this unique green laser pointer is a great resale item for you to easily make some healthy profits. Put some on your online store or sell them to your business associates when they all become jealous after seeing yours! You won’t find the same quality product for any cheaper in addition to the lucrative wholesale opportunities we have on offer. So order yours today and we'll ship it out tomorrow, from your source for high quality electronic gadgets, Chinavasion. Use your powerful laser pointer to point at any desired targets such as projection screens. IMPORTANT NOTE: Avoid direct eye exposure to laser beam (any contact to the human eye can cause permanent damage). Never expose your eyes or anyone else's to the laser beam.